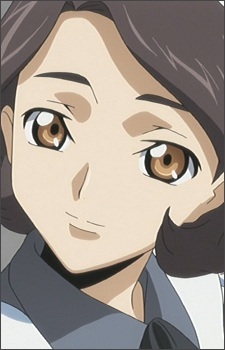 Sayoko Shinozaki is a kindhearted Japanese woman who serves as a maid to the Lamperouge siblings in their residence. She was originally Milly Ashford's personal maid, but was reassigned to Lelouch and Nunnally when they were placed under the Ashfords' care. Her relatively benign appearance contrasts with her position as the 37th successor of the Shinozaki School of martial arts. She is a highly skilled martial artist and has matching athletic talents. She keeps a number of kunai strapped to her thighs and carries smoke bombs. She is referred to as a supermaid on her official profile. The DVD releases for the series occasionally promote a segment called "Sayoko's Diary", which depicts her humorously slanted view of daily life at the Ashford Academy. Sayoko assists in taking care of Nunnally whenever Lelouch is not around. She is later employed by Diethard Reid as a spy for the Black Knights, and escapes capture during the Black Rebellion by leaving for the Chinese Federation with Diethard and several other members. Lelouch reveals his secret identity to her in the second season, and she poses as his double at Ashford while he is away. Though she is able to play the part somewhat convincingly, her aforementioned slanted viewpoint of his daily life leads her to believe that he is a womanizer, and she portrays him as such. Furthermore, she also rather openly displays her athletic prowess during one of Milly's festivals, another contrast with the physically unfit Lelouch. Due to this, Lelouch has decided that Sayoko is to pose as him during all physical ed lessons.